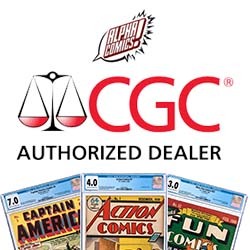 Alpha Comics is a CGC Authorized Member Dealer and accepts your books on your behalf for grading. We are here to help you with any questions you have about grading your comics as well as screening your comics to achieve your grading goals. The Certified Guaranty Company is known world-wide for their service and we are happy to be partnered with them. Below are our available grading services. The service tier you need is decided by the ungraded value of your comic book and your desired turnaround time. Turnaround times are approximate and not guaranteed. Turnaround time includes shipping time. Prices are flat rates that include the cost of shipping, insurance and other fees. CGC, at its sole discretion, determines that the fair market value of a book is higher than the value stated by the submitter, CGC will move the comic book to the appropriate higher tier and the additional charge will be the responsibility of the submitter. Comics submitted for re-certification with their original label ARE NOT GUARANTEED TO RECEIVE THE SAME GRADE. Please remember that CGC does not return mylars or backing boards sent in with comic books. Please turn in books for grading in a bag with a board and no more than one piece of tape.